A variety of safety equipment is required for each skater depending of their program level. For more information about appropriate safety equipment, visit Speed Skate Canada. New this year, tinted safety glasses are NOT allowed during competition. As well, you must have a strap for your glasses. There are various places online you can purchase safety equipment. Olympic Oval Skate Shop, Duvealt Speedskating, and I Love Speedskating are all trusted online resources for speed skating equipment. We also have a Used Equipment Swap Shop where you can find deals on various types of speedskating equipment from skates to skinsuits! Let us know if you have something to sell! Speed skates can be rented from the YKSSC for a cost of $125 per season (additional cheque of $125 is required as deposit). Try on and pick up rental skates from our Skate Coordinator, Greg Skauge. Please contact ykspeedskating@gmail.com for skate rental arrangements. Skates are rented from our locker room at the Multiplex (back room of the Ed Jeske ice surface). Please note that figure skates are NOT permitted for any program level. Speed skates have a different type of blade than hockey or figure skates and therefore need to be sharpened in a special way. Skates should be sharpened before the season, at least once a month and before events/meets to enhance a skater’s ability and protection of our skates. Please contact Greg Skauge, our Skate Coordinator, will advise on who to contact for sharpening. Alternatively, you can drop your skates off with one of the Sr. Competitive skaters during their Sunday ice time. The cost is $10. Cut resistant undersuits are an important piece of safety equipment for our SS3 and Competitive skaters. If you are considering purchasing a cut resistant undersuit please keep in mind that the Club recommends full coverage undersuits (or cut resistant material interwoven into a skin suit). 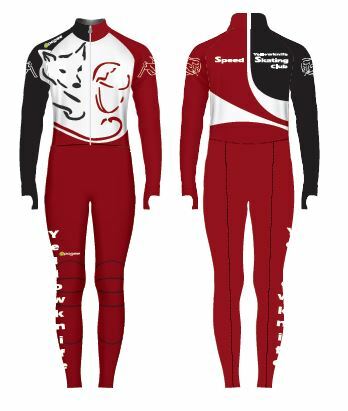 Brand names for this product are Dyneema or Dynamix and these types of suits can be purchased online at Duvealt Speedskating, I Love Speedskating and other speedskating supply stores. If you have any questions about safety equipment please talk to your coach or send us an email. In 2017, YKSSC ordered locally designed club suit for its skaters. This allows our skaters to look and feel good during practice, and it brings them together at tournaments away from home. If we were to do another order, we would need a minimum number of suits. Email us to let us know you are interested – we have a list going! GST will be applied to these prices.